Yogyakarta: Mes Sungun Varzaghan overcame a stiff challenge to defeat Nafit Al-Wasat 3-2 and book their spot in the AFC Futsal Club Championship Indonesia 2018 final on Friday. Mes Sungun were quick off the blocks and came close to taking the lead in the first minute as they pressed Nafit, but Hossein Tayebibidgoli’s volley from the edge of the area missed the target. Nafit kept it tight at the back and countered a minute later with Waleed Khalid Al Mayali’s effort but he pulled his shot wide of the post. It was a tense contest as both teams fought hard for possession and were evenly matched as they struggled to find the net. Mes Sungun looked likely to score whenever they had the ball but Nafit goalkeeper Yahya Abdulnoor Raheem did not flinch as he parried shots from Farhad Fakhim and Tayebibidgoli. 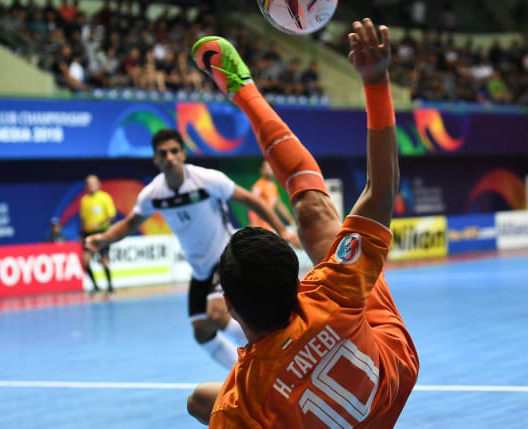 The Islamic Republic of Iran side’s persistence finally paid off through Ali Asghar Hassanzadeh’s effort in the 16th minute when he connected to Abolghasem Orouji’s delivery from the right. A goal down, the Iraqis started applying pressure and Mes Sungun finally cracked when Farhad Tavakoli Roozbahani timed his run perfectly to fire Nafit back into the game with 43 seconds left in the first half. Nafit started the second half brightly and did not give their opponents room to operate as the Iraq club closed down every Mes Sungun attack. However, a lapse in concentration gave Mes Sungun an opening and Hassanzadeh scored with a clinical finish in the 27th minute from the top of the arc. Nafit found themselves on the back foot again and pressed forward to equal the score but their efforts fell flat as Mes Sungun kept their cool and defended well. Nafit executed the power play in the 37th minute but the tactic backfired when they lost the ball midway through their attack and Fakhim punished the Iraq club with Mes Sungun’s third goal as he fired the ball into an empty net from his own half. Ghodrat Bahadori pulled one back for Nafit in the 38th minute but Mes Sungun held on and will face the winners of the Thai Son Nam-Bank of Beirut semi-final, being played later on Friday, in Sunday's final. "We had a good game today, a good first half but we played strong against a tough team like Mes Sungun and the goals we conceded were defensive errors. Now our main focus is the third and fourth placing." "Overall, We were the better team but Nafit made it very hard for us and that was the reason we took so long to score. They have two Iranians playing in their team and they caused a lot of problems for us. I wish Nafit good luck but our focus now is on the final." Yogyakarta: Thai Son Nam will face Mes Sungun Varsaghan in the AFC Futsal Club Championship Indonesia 2018 final after coming from behind to defeat Bank of Beirut 6-5 in a thrilling semi-final on on Friday. Thai Son Nam’s win sets up an enticing final against the Islamic Republic of Iran club while Beirut will play Nafit Al Wasat in the third-place playoff on Sunday. Thai Son Nam started with purpose as they tried to get a head start in the game but the Vietnam club found Beirut’s defence hard to breakdown. Abdultahman Altawail found himself with space and made a surging run in the second minute but Beirut goalkeeper Hussein Hamadani was in top form to deflect the effort. Beirut, however, did not sit back and went ahead in the second minute when Mahdi Javid timed his run to perfection and his pass found Mouhammad Hammoud unmarked in the box and he made no mistake from close range. Thai Son Nam came close to scoring in the seventh minute when Vu Duc Tung hit the woodwork and Chau Doan Phat struck his effort into the stands from the top of the arc. The Lebanese club stayed firm, and in the 15th minute Karim Abou Zeid beat two defenders on the left and fired his shot past Thai Son Nam goalkeeper Ho Van Y to double their advantage. Rattled by the two-goal deficit, Thai Son Nam surged for an opening but Beirut kept it together as they defended from Thai Son Nam’s waves of attacks. The Vietnam club, however, finally found a breakthrough in the 19th minute when Vu Quoc Hung caught Beirut napping as his strike flew past Hamadani. Seconds later, Thai Son Nam attacked in numbers but this time were denied by the crossbar following Pham Suc Hoa’s effort from the top of the arc. In the second half, Bank of Beirut restored their two-goal advantage in the 21st minute after some neat exchanges saw them break down Thai Son Nam’s defence and Hammoud picked up his second of the night from close range. Thai Son Nam played a high-pressing game soon after and should have scored in the 28th minute but were denied by the woodwork once again following Altawail’s volley from outside the box. However, Vu Quoc Hung pulled one back in the 31st minute when he blasted his effort from the top of the arc to reduce Thai Son Nam’s deficit. The Vietnamese club then scored two quickfire goals in the 33rd minute through Vu Duc Tung from close range following Nguyen Thanh Tin’s pass and Nguyen got his name on the scoresheet seconds later after capitalising on a defensive error to fire Thai Son Nam into the lead for the first time in the match. With four minutes left in normal regulation, Beirut activated the power play with Patrick Vieira Luz making up a five-pronged attack but Thai Son Nam’s Nguyen had other ideas when he fired from the centre half into an open goal to make it 5-3. Beirut however hit back when Zeid made his way in the box and scored in the 39th minute to make it 5-4. Thai Son Nam scored again from their own half in the 39th minute from Pham who picked up the loose ball and fired his effort into an empty goal. Beirut tried to fight back and Javid made it 6-5 with seconds left to play after his shot from outside the box found its way past Ho but it was too late as Thai Son Nam held on to seal a place in the final. "I'm very proud of my players. We never gave up and came back fighting to win the match. My players worked very hard and playing Beirut was was not easy in the first half, and we went down 3-1 in the second half but we persevered and now we are in the final." "It's very hard right now and I'm very disappointed, my players are heartbroken. We deserved to win the match against Thai Son Nam and it's very disappointing."